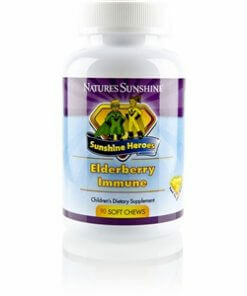 Nature’s Sunshine Sunshine Heroes Elderberry Immune boosts a child’s immune system. Colder seasons can prove challenging to young immune systems, particularly in children whose diets lack essential nutrients. 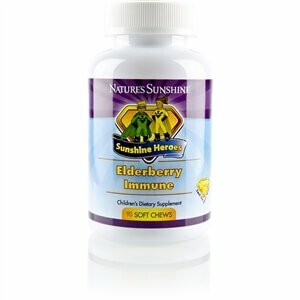 Sunshine Heroes Elderberry Immune provides key vitamins and minerals, intermixed with other nutrients to provide year-round immune support. Sunshine Heroes Elderberry Immune include vitamins D3 and C, zinc, elderberry extract, astragalus root, echinacea root, reishi mushroom, and maitake mushroom along with Nature’s Sunshine own Sunshine Heroes Protector Shield Blend. This convenient, chewable supplement can be taken twice a day and should be chewed thoroughly before swallowing. Instructions: Chew up to two (2) Soft Chews daily as a dietary supplement. Chew carefully and thoroughly before swallowing.